YOU WONDER, "WHERE'S THE ENERGY DOLL?" MAKE NO MISTAKE, HA HA HEN. I'LL SHOW YOU NEVER NEEDED TO KNOW. AMG REVIEW: One can only assume that R. Stevie Moore had been listening heavily to Hot Rats-era Frank Zappa when he wrote and recorded the 1973 album Innuendos (which the wordplay-loving Moore usually refers to as "NUN2"; N-U-N-dos," geddit? ), a largely instrumental collection of long, expansive jams. Recorded in his buddy Billy Anderson's trailer in Goodlettsville, Tennessee, just outside of Nashville, the nine lengthy tracks are powerful, occasionally jazz-tinged rockers (the opening "Meat Shortage" features a squealing free jazz clarinet solo by Roger Ferguson) that are more structured and focused than the aimless noodling of so many similar efforts. While the clear highlight is the appetizingly-named rocker "Look in the Toilet," here both in a fully fleshed-out version and Moore's original one-man-band demo, tracks like the piano/organ duet "Ham Boogy" and the easygoing shuffle "Moon August" are nearly as appealing. Innuendoes is more accessible than many releases from the era before Moore turned full-time to the creation of the engagingly quirky pop songs that made his name, and is a good starting point for fans of Moore's more commercial material who want to venture into his more experimental side. R. Stevie Moore, much like the box of Frankenberry cereal I just purchased to commemorate/commiserate the holiday season being upon us, is always a welcomed surprise. Much like the sugary capitalism that somehow diverts my attention from true necessities, Moore is a distraction that is just as warm, fuzzy and without the feeling of guilt purchasing what amounts to General Mills’ Halloween click bait instills. NUN2 is a recent reissue on the most portable of music mediums (discounting all that newfangled digital bull) well worth the 43 years of hardened marshmallows and pink ghosts. 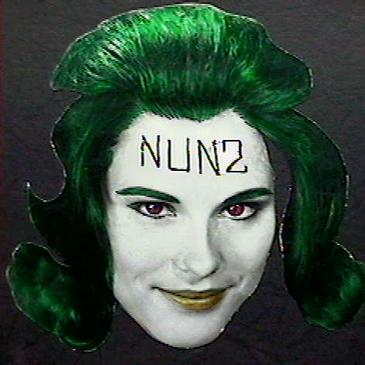 NUN2 is a freaky work out, not far removed from many Zappa experiments of the time. But rather than the just-right over-production of the man who gave us Dweezil, Ahmet, and Moon Unit, the man who cosmically birthed Gary, Mark, Wesley, Ariel (yada yada yada) delivers music at its most primal. And considering the ilk of this here slice of TMT, you can probably guess how we view the dirtier deeds of holistic psychedelia. Sure, Hot Rats is firmly tucked under our pillows as we sleep at night, but R. Stevie Moore is Beefheart, Zappa, and Shuggie rolled into one. Or, for the less fashionable, he’s the best hits of Frankenberry, Boo Berry, and Count Chocula. He’s the Neapolitan of post-revisionism, where you think you really don’t want those flavors mixed together but your younger self will pop up and let you know you really, really do. So give me a giant scoop of NUN2, top it with every novelty cereal you can find, and let Moore force feed it to you.